So when an enormous white bear shows up one cold autumn evening and asks teenage Rose to come away with it--in exchange for health and prosperity for her ailing family--she readily agrees. 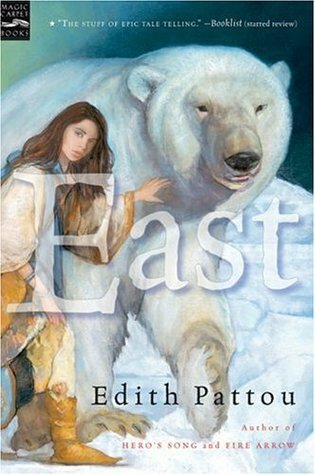 East only came to my attention last year when people started actively searching for ARCs of West by the same author. I'd never heard of this book, despite my love of retellings, and new I had to read it as soon as possible for the retellings challenge I'm hosting this year! This is a retelling of East of the Sun West of the Moon, a fairy tale I'd honestly never heard of before even though (I guess??) I've read a few retellings already. Rose is the main character, born to a large family and a very superstitious mother. One day she leaves with a white bear to help her family and then her adventure begins. I... didn't care for Rose. This book is written with a definite fairy tale flair, but it ended up making me feel extremely detached from the characters. The author also chose to use multiple viewpoints, so there were multiple characters I couldn't care less for and I never really felt like I knew any of them. The white bear was very strange, along with all the other characters in his home. One plot point involving a strange person sleeping in Rose's bed without her consent was just creepy. East also happens to be incredibly long, much longer than it has any need to be. There was a lot of walking and talking and swimming and eating and sleeping and I was just so bored. The author does a lot of showing rather than telling, which made me feel like I couldn't truly see or appreciate the world that should definitely have been magical. I toughed it out for 250 pages, which is probably about how long this book should have been. It seemed that if, after 250 pages I couldn't care less if the characters died, it was time to give up and move onto something else. I wanted to enjoy this retelling so much, but it just wasn't for me.